For many gardeners, weeds are the devil’s bane and must be kept out of the landscape. But did you know that many common weeds bloom into an attractive lure for beautiful butterflies and moths? If you love watching the flirting dance of the butterflies, it is important to know what to plant for migrating butterflies. Having plants for migrating butterflies attracts them, fueling the insects for their journey, and gives you a hand in their important and fascinating life cycle. It may seem like a crazy idea, but keeping weeds in gardens for butterflies is a helpful practice. Humans have destroyed so much native habitat that migratory butterflies can starve as they move to their destination. Cultivating plants for butterfly migration entices these pollinators and gives them strength for their long migration. Without fuel for their migration, butterfly populations will decline and along with them a part of our earthly diversity and health. Not all butterflies migrate, but many, like the Monarch, undergo arduous travels to reach warmer climates for winter. They must travel to either Mexico or California where they stay during the cold season. Butterflies only live 4 to 6 weeks. Which means the returning generation may be 3 or 4 removed from the original butterfly that started the migration. It can take months for the butterflies to reach their destination, which is why a path of readily available food is necessary. 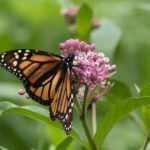 Plants for migrating butterflies can be more than the milkweed preferred by Monarchs. There are many types of flowering plants that butterflies will use as they are on their journey. 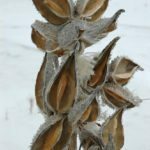 Keeping weeds in gardens for butterflies may not be everyone’s cup of tea, but there are several lovely varieties of Asclepias, or milkweed, that attract these insects.